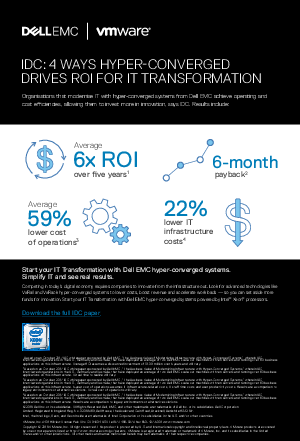 Start your IT Transformation with Dell EMC hyper-converged systems. Simplify IT and see real results. Competing in today’s digital economy requires companies to innovate from the infrastructure out. Look for advanced technologies like VxRail and VxRack hyper-converged systems to lower costs, boost revenue and accelerate workloads — so you can set aside more funds for innovation. Start your IT Transformation with Dell EMC solutions powered by Intel®.